WATERLOO – Shohini Ghose, a professor in Wilfrid Laurier University’s Department of Physics and Computer Science, will present a public lecture, entitled “Gravitational Waves and General Relativity for All,” March 22 at Laurier’s Waterloo campus. Ghose’s lecture will discuss Einstein’s general theory of relativity and how it led to his prediction of gravitational waves. Ghose will also explain the importance of this scientific discovery and how it impacts our understanding of the universe. 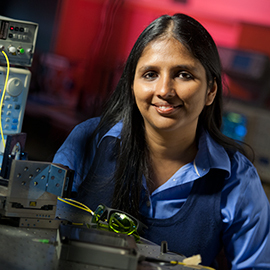 Ghose is also the director of Laurier’s Centre for Women in Science and a 2014 TED Fellow. The lecture, part of a monthly series of talks sponsored by Laurier’s Department of Physics and Computer Science, will be held March 22 at 4 p.m. in room N1057 of the Science Building. The event is free and open to the public. Prior knowledge of physics is not required. For more information, please contact Ilias Kotsireas at 519-884-0710 x2218.